In the harsh environment of northern Kenya, communities struggle with frequent droughts, poor health care, sparse or irregular government services and the threats posed by cattle rustling and ivory poaching. Ethnic rivalries dating back many centuries continue to disturb peace and undermine development. However, all this is beginning to change, thanks to a new movement based on community conservation. Operating under the umbrella of the Northern Rangelands Trust (NRT), 27 community conservancies are now managing over 3 million hectares of land – an area one and half times the size of Wales. The conservancies vary in size from just over 5,000 hectares in the case of Ngare Ndare to Namunyak’s 394,000 hectares. Each is managed by a board of directors which is elected by the local community, and the board is responsible for hiring staff and controlling the conservancy budget. 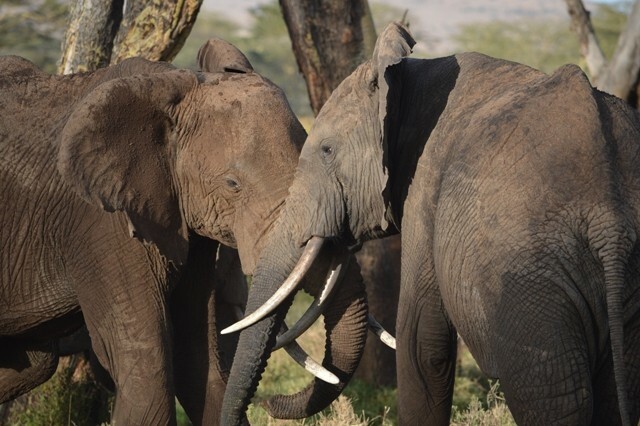 The conservancies have helped to reduce ivory poaching. The conservancies are safeguarding the future of a wide range of endangered species, including elephant, lions, wild dog, hirola and grevy’s zebra, and restoring the degraded rangelands. With the help of NRT, they have created over 500 permanent jobs and improved the livelihoods and welfare of tens of thousands of pastoralists and their families. Conservation and the receipts from tourism are generating millions of dollars of investment, bringing much-needed services, including better education and health care, to remote and marginalised communities. In 2014, I was invited by Mike Harrison, NRT’s chief executive officer, to make a series of photo films and podcasts telling the story of NRT and the community conservancies through the people who live and work there. You can see and hear them here. They provide an insight into why community conservancies are so important, and why they could represent the future of conservation in many parts of the developing world. This is the story of conservation for the people, by the people.